FREE! Magazine » Rautatientori: the throbbing heart of Helsinki. Rautatientori: the throbbing heart of Helsinki. If you are a new visitor in the Finnish capital or just basically if you live in Helsinki, it is almost impossible that you spend many days without your steps guiding you around the Railway Station Square or “Rautatientori” as it is called in Finnish. I still remember the first time I stepped there and I was naively surprised to find many of the street signals written in both Finnish and Swedish languages. Rautatientori is the spot where most of the foreign people get the real first contact with Helsinki, as trains from St. Petersburg arrive there as well as buses from Vantaa airport. Added to that, it is also the main point where all the local trains connect to destinations in Helsinki and nearby cities Espoo and Vantaa, as well as the most transited metro station and also the departing point of many bus lines on both sides of the Station building and also the trams that allow you more slowly and pleasantly to have a great view of the city. 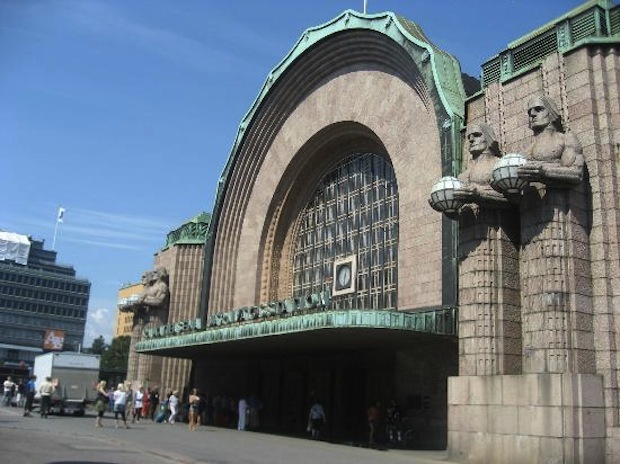 Although relatively a new building, opening its doors in 1982, the Helsinki Railway station is also one of the most recognizable architectural work in Finland due to the unmistakeable two pair of statues holding spherical lamps that decorate the facade outside and that are widespread used in commercials and parodies, giving the station a unique “Gotham City alike” touch. But not only the station itself is worthy to mention in the square. The visitor can pretty much find anything interesting to do in every corner of the station square. Around in a few meters the walker can see and visit the National Finnish Theatre and the Ateneum Museum if you are into arts and culture. For those who like tempting the luck live apart from gambling online in sites like casino.com, the Casino Helsinki is also located in the Railway Square surrounded by many interesting bars and restaurants to enjoy good food and relaxing drinks. And on winter there is also the possibility to practice ice skating in the ice rink located there. Shopping is also pretty much just something that you can do walking a few meters away from the station, as you can find shopping malls just in front of the station and a few meters away like the infamous Sokos, Forum or Stockmann. The station has also a lot of R Kioski where travelers can load their travel cards and buy snacks and drinks apart from different fast food chain restaurants to have a tasty quick bite before continuing the journey. The main office of Helsinki Transportation Office is located also in Rautatientori, downstairs near the Metro entrance, and if you are a permanent resident of Helsinki you can get a transport card that can make your live much more easier to move around the city. As you see, Rautatientori has just condensed almost everything that a visitor needs for enjoying the stay in Helsinki. Although we advise you just to visit as many areas as possible, do not waste your chance to investigate all the adventures that the emblematic Railway Station and its square have awaiting for you!